These adorable pirate ship cupcakes were made with fun free pirate party printables from Cottage Industrialist. 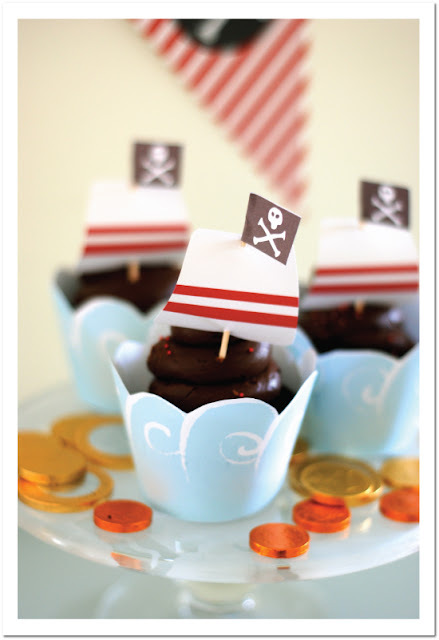 If a pirate themed party is in your future, these printables are a real treasure. There are more than just the cute cupcakes! There are invitations, pirate hats and mustaches, pirate bunting, thank you cards, and envelopes that look like treasure maps. And they are all SO CUTE! You can get them all HERE. I used these last month for an awesome Pirate Playdate and it turned out great!